This post is an add-on to my introductory post [here], which was about the consistently major benefits of well-managed goals, and about how goals work. Well-set difficult goals work because they (1) focus attention onto what’s important and away from everything else, (2) motivate greater effort and persistence than simply doing your best, and (3) stimulate use of better strategies to reach them. These characteristics are personified in the extreme by the stars of the documentary “March of the Penguins”. 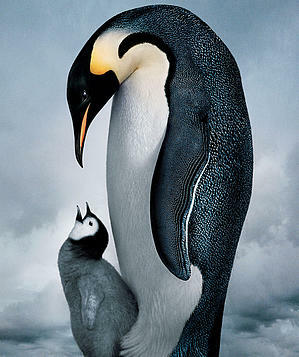 Emperor Penguins choose a breeding ground on ice that is solid year round. At the beginning of the Antarctic summer, the breeding ground is only a few hundred meters away from the open water where the penguins can feed. By the end of summer, the breeding ground is over 60 miles away from the nearest open water, and gets further away every month. The female lays a single egg each breeding season, and the goal is to keep the chick alive for eight months in one of the most hostile environments on earth, miles from food sources, until it can fend for itself. The males and females are together on the breeding ground for two months after mating until the eggs are laid. If the egg is to survive, it needs to stay warm. So after the female lays the egg, she transfers it to the feet of the waiting male, minimising exposure to the intense cold that would kill the developing embryo. The male tends to the egg while the female returns to the sea, now even farther away, both in order to feed herself and to obtain extra food for feeding her chick. For an additional two months, while the female make the return trip to the sea, the males huddle together to stay warm enough to incubate their eggs. The females have not eaten in two months by the time they leave the hatching area, and have lost a third of their body weight. They then need to travel 50 miles to reach the open ocean. The males meanwhile endure temperatures approaching −62 °C (−80 °F), with falling snow their only source of water. By the time the females return, the males have lost half their weight and have not eaten for four months. When mother penguins come back and feed their young, the male penguins take their turn to go to the sea, now 70 miles away, to feed themselves. The parents continue this shuttling back and forth to the sea for an additional four months, until finally the parents can leave the chicks to fend for themselves. The Emperor penguins have devised a multitude of ingenious strategies to keep the chick alive in this crazily hostile situation. In addition to the female-male-female tag game and the keep-warm huddle, memorable strategies include the males taking turns on the cold outside of the huddle and, in desperate near-starvation circumstances, feeding eleventh-hour nourishment direct from the father-penguins' throat sacs. Here’s my point in this example. If an important goal can stimulate this phenomenal focused attention, persistence and ingenuity in a penguin, I would hope that goals can be helpful for us too. Copyright Latitude 2011. All rights reserved.